The most important practice in Tibetan Buddhism is Guru Yoga, meditation and mantra on the spiritual head and teacher of the tradition, which is seen as living Buddha, embodiment of three kayas and 10 bhumi (extraordinary powers). In Kagyu tradition the head Lama is Gyalwa Karmapa and his mantra is Karmapa Chenno. It is believed sounds of this mantra are directly connected with the enlightened mind of HH Karmapa and carry its enlightened qualities and brings help when it is most necessary for the benefit of student. Here I would like to share with you a story about the origins of Karmapa Chenno mantra. The Karmapa mantra has originated at the times of 8th Karmapa Mikyo Dorje (1507-1554) in context of teaching about "Calling the Lama from afar." “Karmapa Chenno” can be roughly translated as "Embodiment of the compassion of all Buddhas, turn attention to me." In Central Tibet, Sikkim and Bhutan, it is pronounced Karmapa Kyen-no or Karmapa khen-no. In East Tibet, it is pronounced "Karmapa chenno. "In western countries the most widespread pronunciation is Karmapa Chenno and it is considered correct. One day, in 16th century, the head of a nomadic household in desolate, windswept northern Tibet passed away. In such a sparsely inhabited region it was rare to find monasteries and lamas to perform Buddhist funeral rites, so the family wondered what to do. Then they noticed a ragged individual travelling on foot who appeared as if he could be either an itinerant yogi or a beggar, so they went to inquire. The mendicant turned out to be, in fact, a lama. The grieving family requested his ministrations for the deceased, and he complied. When he reached the man's deathbed and began his incantations, the family respectfully requested the lama to perform phowa (consciousness transference to higher realms). The lama, however, said: "I am just a poor, uneducated practitioner of the Buddha's teachings; I have not mastered that esoteric practice. But I do have one positive quality, infinite faith in the living Buddha, named Lama Karmapa; he is like the great gate to Dewachen (a transcendent Pure Land from which evolution on the path of enlightenment is said to be more easily assured). His name is the magic password to that fabulous spiritual domain." Then he began reciting again and again the powerful name-mantra, "Karmapa Khyenno!" "Karmapa Khyenno, Karmapa Khyenno," he intoned loudly, again and again. After each and every rosary of one hundred and eight fervent recitations, he would then hit the corpse with his mala, or prayer beads, commanding that, in the name of the Buddha Karmapa, the spirit of the deceased be reborn in Dewachen. After some time, everyone noticed that the signs of successful consciousness transference began to appear. Hair fell from the top of the corpse's head; there was a pleasant fragrance in the air, and a large bump appeared at the crown aperture where the subtle consciousness of the deceased departed for the other world. 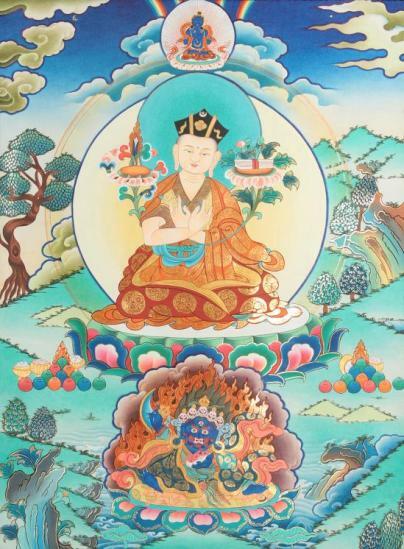 Everyone present rejoiced, and gratefully thanked the mendicant lama. All began to faithfully practice the mantra of the Karmapa, praying to realize the great freedom and bliss of Dewachen in this very lifetime. The travelling lama soon continued on his journey. One day he heard that the omniscient Karmapa was visiting south Tibet, so he determined to go and meet him and pay his respects. Upon finally reaching his destination, the first thing the clairvoyant Karmapa said to him was: "That was a difficult phowa we performed up there in the north, wasn't it?" The Karmapa laughed, hitting the other lama with his mala. Then the mendicant knew with unshakable certainty that the Karmapa is an omniscient living Buddha, who always keeps his disciples, wherever they are, in his heart and mind. Since those days Karmapa Chenno is the most important mantra to invoke the enlightened qualities and powers of Karmapa in Kagyu tradition of Tibetan Buddhism. With the name of Karmapa is understood not just some particular individual, but the enlightened qualities of all Buddhas and Bodhisattvas. Karmapa is the one who embodies all three jewels of refuge, Buddha, Dharma and Sangha for his students. This is the story on origin of Karmapa mantra I have heard.